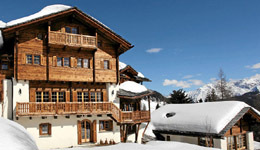 Davos and Klosters are Switzerland’s elite play ground. Davos is one of the oldest and most fashionable resort towns and is the highest city in Europe living up to its reputation for excellent skiing, fresh clean air and of course the best apres ski. With five ski areas spread out on both sides of the valley and descents from almost 9,000 feet, Davos offers the alpine skier an endless variety of terrain. Klosters is a smaller quaint and picturesque village located just before Davos offering activities such as golf, shopping, tennis, or squash.